When Holland America’s Koningsdam enters service, it seems like it might be fitting to update the expression to say, “The sun never sets on the Memphis empire.” Koningsdam will be the eighth ship in the Holland America fleet to have a B.B. King's Blues Club aboard. As widely scattered as Holland America ships are around the world, and as many have branches of the iconic Memphis club - that statement about the sun never setting is quite possibly true. The two cruise lines with passengers in the middle of yesterday’s terrorist attack at the Bardo Museum in Tunis were today finishing accounting for their passengers, helping those needing it, and considering where to go from here. In the end, 17 passengers died in the attack, and 21 passengers were injured. Both lines - MSC and Costa - have canceled the rest of the year’s calls at Tunis, and other lines have begun to follow suit. 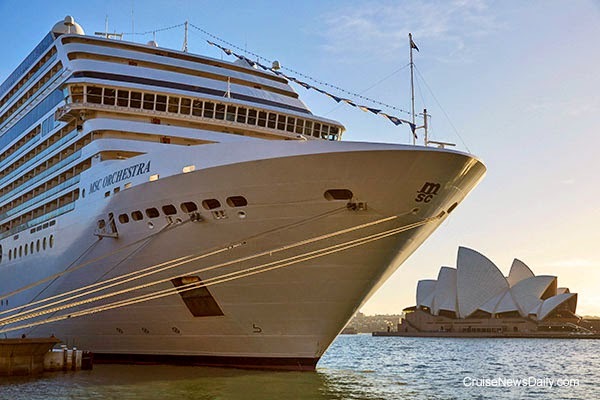 As we reported earlier, four Carnival Australia ships will be delivering relief supplies to the Vanuatu islands which were hard hit by Cyclone Pam a week ago. More supplies will likely follow on later ships. 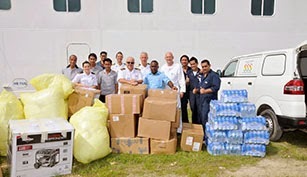 Carnival Legend arrived at Santo on Thursday with bottled water, a generator and other needed supplies. Some of the cruise industry’s worst fears about terrorism came true today in Tunis. Terrorists opened fire on innocent people in front of the Bardo Museum choosing their targets, according to media reports, because they were tourists, and they were identified as such by the fact that they were getting off tour buses from cruise ships. Some who were escaping the chaotic scene in front of the museum by running into it were taken hostage there. Both attackers and police were killed as police brought order and freed the hostages, but some of the gunmen are believed to have escaped. Information coming out of Tunis is still changing constantly but the death toll among tourists now is reported to be 20, including Italian, Polish, German and Spanish citizens. Five police officers and two gunmen are also reported dead. At least 20 other tourists are believed to have been wounded during the attack. Tuesday evening, a 54-year-old man was reported to Carnival to be missing aboard Carnival Triumph. The ship had left Cozumel earlier in the afternoon. A review of video recordings confirmed the man had gone overboard north of the Yucatan Peninsula. Details appear in the March 18 edition of Cruise News Daily. Geneva, 19 March 2015 – In the wake of Thursday’s (18 March) terror attack at the Bordo National Museum, in Tunis, MSC Cruises has decided to suspend all remaining Tunisian calls in the 2015 summer programme in the interests of guest and crewmember safety. MSC Cruises reports that the remaining two guests who had been missing following the tragic events of yesterday in Tunis were found safe and sound. The two Spanish citizens, Cristina Rubio Benlloch and Juan Carlos Sanchez Oltra, a young couple traveling on board MSC Splendida, had spent the night in hiding at the Bardo National Museum. The woman, who is pregnant, was immediately taken in observation to the hospital. Both her and the child are reported well. Following the news that the young Spanish couple are safely accounted for, MSC Cruises sadly confirms that, based on the information available as of today, 12 MSC Cruises guests are dead (nationalities: 2 Colombians, 3 French, 3 Japanese, 2 Spanish, 1 British and 1 Belgian) and 13 are injured (nationalities: 1 Belgian, 7 French, 4 Japanese and 1 South African), of which two are in serious conditions. Pierfrancesco Vago, Executive Chairman of MSC Cruises, while in Tunis today to meet the injured and their families to ensure that they are receiving all the necessary assistance, met the Tunisian Minister of Tourism, Ms. Salma Elloumi Rekik. At the meeting, the Minister confirmed that, in conjunction with yesterday’s tragic events, a total of 20 people died, seven of whom have yet to be identified. MSC Cruises confirms that its ship MSC Splendida has left the port of La Goulette, Tunis, this morning at 6AM. MSC Splendida received the authorisation from the relevant authorities to leave the port of La Goulette and is heading, as originally scheduled, to Barcelona where it is currently expected to arrive at 9AM on Friday 20 March. MSC Cruises is present on site with its crises team in order to continue to provide key assistance on the ground to MSC Splendida’s guests who were involved in the tragic events and needing assistance. MSC Cruises Executive Chairman, Pierfrancesco Vago, will be arriving in Tunis in the coming hours in order to make a close assessment of the situation, meet in person as well as arrange to provide assistance to those affected by these tragic events and their relatives and consult with local authorities. On 18 March, MSC Splendida called the port of La Goulette, Tunis for its weekly call performed during the season from 17 December 2014 to 15 April 2015. The ship arrived with 3,714 guests and 1,267 crewmembers aboard. As it is the case every time the ship calls Tunis, a shore excursion offered MSC Cruises’ guests the opportunity to visit the famous Bardo National Museum. During the visit at the museum, some of MSC Cruises’ guests were caught in the middle of a terrorist attack along with guests from another cruise line. As soon as the company heard of the attack and the fact that some of its guests were involved this tragedy, regular stringent safety procedures were set in motion and the ship management called for the immediate cancellation of all on-going shore excursions and recall all buses and their passengers on the ground back to the ship. The security on board was also immediately raised to Level 3, its highest, by emergency protocol to ensure complete safety of all guests and crew members – the company’s number one priority at all times. In constant coordination with local, national and international authorities as well as embassies in Tunis and ground staff, MSC Splendida’s command worked towards organising the safe return of the ship’s guests aboard, and assessing the situation in the city’s hospitals. Keeping guests aboard informed of the unfolding of the situation took constant synchronization between all actors aboard and ashore and filtering of the stream of sometimes contradicting information from various sources. Finally, to allow all guests to promptly contact their families and loved ones at home and to provide reassurance about their wellbeing, all onboard telephony and internet was made available. In the meantime, only a few hours after the tragic events, MSC Cruises’ Crisis Team reached the ship in Tunis and immediately set out to work and started providing assistance and support to guests in this painful moment. MSC Cruises Executive Chairman, Pierfrancesco Vago, will arrive in Tunis in the early hours of 19 March in order to make a close assessment of the situation, also to provide assistance to the victims and their relatives as well as consult with local authorities. According to sources it would appear that of the victims, three were of Japanese nationality, two French, two Spanish and two were Colombian. The wounded, of which three Japanese nationals, one South African, one Belgian and seven French, are currently being treated in various hospitals. All of them are being assisted in person by members of the MSC Cruises Crisis Team that was immediately sent to Tunis to provide on the ground support. MSC Cruises will continue to publish updates on any confirmed official information it may receive. At this tragic time, the MSC Cruises family wishes to extend its most sincere and heartfelt condolences to all those who were affected by this tragic event and are suffering as a result, in particular to the families and friends of those who lost their lives as well as the injured ones. MSC Cruises extends its deepest sympathies to the families and loved ones of the victims of today’s tragic events in Tunis. MSC Cruises remains in close contact with the relevant national and international authorities, local authorities, the ship captain as well as with the port agent to constantly monitor the situation as it unfolds. The command and the entire crew of MSC Splendida is working hard to ensure guests on board are regularly kept abreast of the situation as updates are received from the relevant authorities. MSC Cruises immediately set up a Task Force to support the ship and all its guests. We’ve also maintained continuous and constant contact with the embassies of about 50 countries whose nationals were on board so as to receive all relevant pieces of information in a timely manner. The safety and well-being of our guests is MSC Cruises’ number one priority at all times. At the time of the events, some of MSC Splendida guests were on shore excursions. Consequently, all MSC Cruises coaches on tour at the time of the events were immediately ordered back to the port and all other excursions and on the ground activities were immediately suspended. To assist guests in contacting their families and loved ones back at home, onboard internet and telephone services are readily available and free of charge. In the early hours of the evening, MSC Cruises’ Care Team reached the ship in Tunis. They’ve immediately set out to work to start providing assistance and support to guests in this heart-breaking moment. One of our ships, MSC Splendida was calling the port of La Goulette, Tunis with 3,714 guests and 1,267crew members aboard. At the time of the events, some of MSC Splendida guests were on shore excursions, including to the Bardo National Museum. Consequently, all MSC Cruises coaches on tour at the time of the events were immediately ordered back to the port and all other excursions and on the ground activities were immediately suspended. At this time, the return of passengers to the ship is still undergoing (please note that all the passengers of United States and Canadian nationality are all accounted for and safely back on board). The ship’s departure, originally scheduled for tonight, was postponed. For this, local security authorities set up exceptional security measures in the port and around the ships to ensure the utmost safety of MSC Cruises’ guests and crew members. An MSC Cruises team comprised of representatives from the Company’s ownership, its management and dedicated Care task force is currently on its way to Tunisia to provide all possible support to guests onboard and to work closely with local authorities. As soon as the ship’s command was notified about the attack at Museo Bardo they immediately activated our Company Emergency Response procedures, recalled all excursions to return on board, and care team and company senior executives were deployed on site. Our Crisis Team immediately established close communication with the Italian Ministry of Foreign Affairs, Local Security Authorities and our Port Agent together with the Captain of Costa Fascinosa for a continuous assessment of the situation on site and its evolution in order to collect continuous updates. 15 Costa Care Team members and 2 Costa headquarters Executives reached Tunis later in the afternoon, and immediately began providing assistance on site to our Guests, and establishing close communications with local authorities. Costa Fascinosa departed Tunis at 1:55 am on Thursday March 19th with 3,148 pax on board. Costa Executive Vice President Sales & Marketing Norbert Stiekema embarked on board Costa Fascinosa and began establishing close contact with the guests impacted by this shocking experience. All Guests on board have been given the opportunity to disembark upon arrival to the next port of Palma de Mallorca on Friday March 20th, and for those choosing this option Costa will take care of their return to their home country. In memory of all the victims of this terrible attack, a minute of silence has been observed today at Costa Crociere headquarter in Genoa, in all worldwide offices and onboard our ships. All the entertainment activities have been suspended on board our fleet. Our immediate priority is the assistance to our passengers and crew affected by this tragic event, and ensuring their safe passage home. Costa Care Team members together with Costa Senior Vice President Beniamino Maltese are currently in Tunis taking care of the companions of the victims and of the 8 guests who are hospitalized. After this event, Costa has announced all future calls in Tunis are suspended. We are constantly in contact with the Italian Government and the Tunisian security authorities. We would like to thank the Italian Minister of Foreign Affairs and his Office for the close co-operation in managing this crisis. "With great sadness we regret to report that 3 passengers of the Costa Fascinosa are amongst the victims of this barbaric and horrific terror attack in Tunis, and further 8 guests are injured. In addition 2 remain unaccounted for. We strongly condemn the attack on democratic Tunisia. Our deepest sympathy and our condolences go to the victims and their families. We share their sorrow. We are in constant contact with the Italian Government and the security authorities of Tunisia as well as of other countries. We would like to thank the Italian Minister of Foreign Affairs and his structure for their co-operation". ###Costa Crociere confirms that Costa Fascinosa left Tunis port at 1.55 am. The Captain reported that there are still 13 passengers who did not return back onboard at the time of departure. Further to this morning attack in Tunis, Costa Crociere confirms that some of its guests had booked a Shore Excursion in the City. Upon being notified the Ship’s Command have immediately recalled all excursions to return on board. The safety of our Guests and Crew both on board as well as during shore excursions is the top priority for Costa. The company is in close contact with the Italian Ministry of Foreign Affairs, Local Security Authorities, the Captain of Costa Fascinosa and our local Port Agent for a continuous assessment of the situation on site and its evolution so to collect updated information from the Authorities. 3161 Guests were on board this cruise. The departure of the ship from Tunis which was scheduled for tonight at 7pm has been postponed to tomorrow Thursday 19 march time to be confirmed. Costa HQ management and Costa Care Team are travelling to Tunis to reach the ship tonight in order to liaise with the local Authorities and passengers on board. Extra security measures are taken by local security Authorities around the port to ensure the security of ship, its passengers and the crew. Costa Crociere expresses its sympathy to all the people and their families involved in today's tragic event. Further to this morning attack in Tunis, Costa Crociere confirms that some of its guests had booked a Shore Excursion in the City. Upon being notified the Ship’s Command have immediately recalled all excursions to return on board. The company is in close contact with the Italian Ministry of Foreign Affairs, Local Security Authorities, the Captain of Costa Fascinosa and our local Port Agent for a continuous assessment of the situation on site and its evolution so to collect updated information from the Authorities. 3161 Guests were on board this cruise. The departure of the ship from Tunis which is scheduled for tonight at 8pm will most probably be delayed. Costa HQ management and Care Team are travelling to Tunis to reach the ship tonight in order to liaise with the local Authorities and passengers on board. Extra security measures are taken by local security Authorities around the port to ensure the security of ship, its passengers and the crew. MSC Cruises said today they have big things in store for Miami, and all of them will support MSC’s growing emphasis on the Caribbean. Those big things include an additional ship, a new ship, a dedicated terminal and a very special event. Yesterday we told you how Carnival Australia had a generous “initial” response to the needs in the Vanuatu island chain as a result of the devastation from Cyclone (hurricane) Pam over the weekend. Today, that response became twice as generous as the company’s donation was matched with a $150,000 personal donation from the company’s chairman, Micky Arison, by way of the Micky and Madeleine Arison Family Foundation. 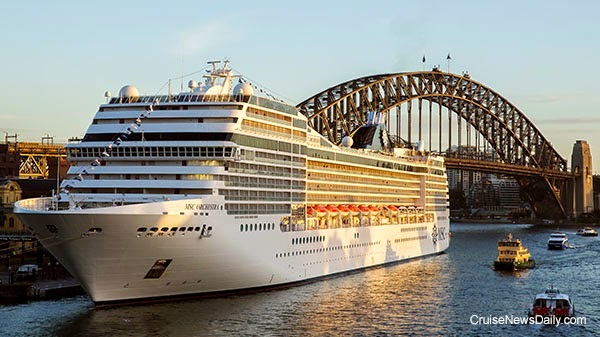 When MSC Orchestra arrived at Sydney this morning, it was not only the ship's maiden call at the Australian cruise hub, but also the line's first call there as well. Think back to the beginning of the cruise industry at a time when cruise lines, whose names are no longer household words, plied the seas. Ships didn’t go on seven-day cruises that fit neatly into a one-week box, like everybody has the same length vacation. Some did, but that was because seven was just another number. They went on varied itineraries, with ports chosen by the lines because that’s where their customers wanted to go, and the lengths were dictated by how long it would take to get there. Then as ships became larger and more plentiful, and cruises became more mass market, seven-day cruises rose to fame. Most people wanted to go on a week’s vacation, and with a single itinerary repeating every week, they were easy for travel agents to remember and sell. Carnival - who was one of the early-adopters of the seven-day concept - is now trying something in New York from days gone by. Next summer Carnival Sunshine will sail 20 cruises from the Big Apple. In those 20 cruises there will be eight different itineraries of varying lengths from two to 10 days. While the destination is not well-known to US cruisers, it is included on many itineraries from Australia and on transpacific cruises. As the largest cruise operator in the Australia/New Zealand/South Pacific region, with the most calls to Vanuatu destinations, Carnival Australia is stepping up to the plate with an immediate $150,000 donation for relief.